After making a special trip with Em on Saturday, in the snowy cold, to see Doug Wheeler’s light installation titled SA MI 75 DZ NY 12 at the David Zwirner Gallery, we left promptly due to the crowded waiting area we descended upon and the one-hour wait ahead of us — I’m often deluded into thinking that I’m the only one who has these great ideas in NYC…but really, who goes to Chelsea on a frigid, snowy weekend? Apparently: a lot of people. — So, today, a Tuesday afternoon, I thought I’d quickly pop in but, alas, there would be no popping in. There was still a half-hour wait but, seating was available and the musical-chairs-style line kept me active. Now, back to the exhibit: Amazing. The bright white light installation is the closest thing to what, I imagine, standing in a cloud might feel like. The first impression is that of a flat wall created by light. As one reluctantly steps forward—wearing the white booties provided by the gallery to keep things pristine—it feels as though you’re stepping into the void. The minute the light box is entered, all depth perception disappears. There’s a dense fog-like effect that’s created with light and white paint. The walls have been curved and the lack of hard lines or horizon intensifies the confusing sensation. The result is at first a little unsettling, but the incredible coolness instantly follows. The light in the box fluctuates emulating the light of day, from dawn to dusk, in a 32-minute loop. If you’re in New York, you might want to check it out. 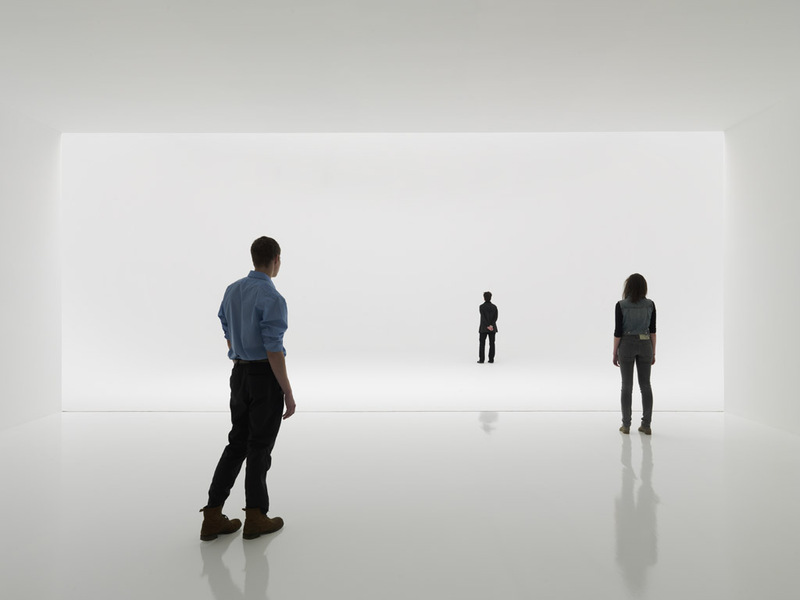 Doug Wheeler’s installation is on view at David Zwirner through February 25, 2012. I recommend a weekday, if possible, for a shorter wait. Photos courtesy of David Zwirner; Carolina A. Miranda; and soulellis’ flickr. This entry was posted in Art, Event, Fun, Interaction Design, Just Plain Cool, Light, NYC, Stuff We Like. Bookmark the permalink. 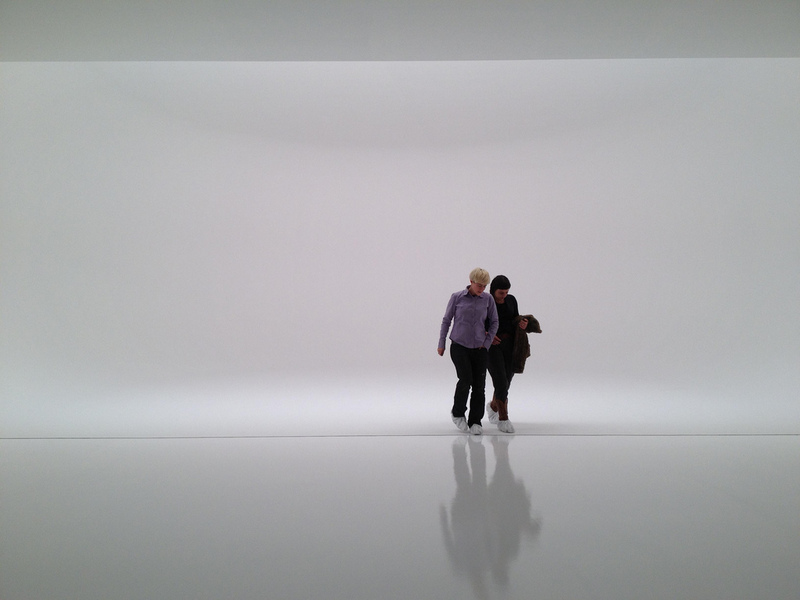 a white room with a white light. sounds profound. really excellent post though. Ah, but you see, it’s NOT just “a white room with a white light”; it’s quite a unique experience. You should go. Our studio has one of these…it’s called a white sweep. We have a green one, too. Trust me, it’s not a white sweep (or a green one.) It’s hard to tell from the photos, but it’s a room with an infinite feel. One can also have the same sensation by walking around your room at night with your eyes closed. Well, at least that’s closer than the white sweep. James Turrell did something similar in Venice last summer. The installation did bring James Turrell to mind. There’s something a little more frigid but, at the same time, quasi/ mock transcendental about this piece than I think Turrell would allow. Nice post! Amazing work! Funny how people talk so diminishing about it, until they’ve experienced it. Thanks for the post. I would suggest getting in touch with the David Zwirner gallery. They may be able to help you. Good luck.